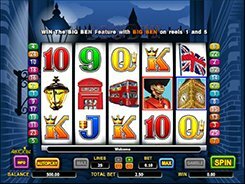 Big Ben is an engaging 5-reel video slot that has a truly British charm. 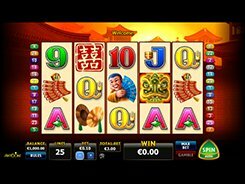 On the reels, you will come across the symbols that are normally associated with London and Great Britain; some of them are a double decker, the Union Jack, an old Red Phone Booth, London’s iconic clock tower known as Big Ben, etc. 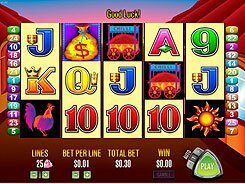 By changing the number of paylines and a coin size, you may make a bet ranging from $0.02 to $100 per spin. The Guard is a wild and the biggest payer in the slot. 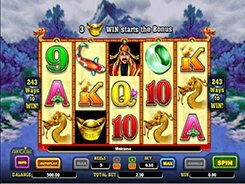 Get five of them on an enabled line and celebrate a 30,000-coin win which is a stunning $120,000 if playing at max! 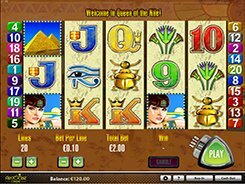 The Big Ben is a scatter, with 3+ activating 15, 20 or 25 free games with all payouts doubled. Furthermore, the scatter symbol landed on reels 1 and 5 at a time starts the Big Ben feature. The clock then starts chiming, and the number of chimes will determine the cash prize for the bonus feature. The maximum amount that can be won in the Big Ben feature is x500 times a total bet. 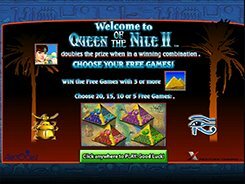 After any winning spin, you may opt to gamble your winnings in a standard Guess the Card Color/Suit mini-game.